Teacher unions will have to deal with a Republican president for at least the next two years, so the midterm elections for control of the House and the Senate take on added importance. Most pundits give the Democrats a very good chance to recapture the House, but the Senate will be a stiffer challenge. Thirty-five Senate seats will be contested this fall, including the addition of special elections in Minnesota and Mississippi, but only a handful of these are really up for grabs. The good news for the teacher unions is that the Democrats need a net gain of only two seats to win a majority. The bad news is — absent an overwhelming Democratic wave — they will have to pick up those seats in very unfriendly territory while keeping all of their own vulnerable seats. As much as we in the field would like to think that education is a critical issue, it barely makes an appearance in the national consciousness. Only 2 percent of Americans list it as the nation’s most important problem. “Dissatisfaction with government/Poor leadership” leads the way with 21%, followed by “Immigration/Illegal aliens” with 16% in the latest monthly Gallup poll. But teacher unions still reap benefits in the event that Democrats regain a majority of seats. The most obvious is a de facto veto over President Trump’s judicial and Cabinet nominees. Legislatively, they will still have to wait until 2020 to attempt to reverse their declining fortunes. ● California, where two acceptable Democrats are facing each other. Of the remaining 29 races, 19 involve NEA defending a friendly Democratic or independent incumbent in a safe state. The union’s endorsement in these campaigns is necessary to maintain cordial relations, but its maximum efforts lie elsewhere. These final 10 states are where success is not assured and ultimate control of the Senate rests. Two of the states where NEA is backing a challenger — Nebraska and Wyoming — are moon shots without any real expectation of success. That leaves eight campaigns where NEA will expend much of its resources and deploy political staff. Four are currently held by Democrats and four by Republicans. All eight are listed as toss-ups in the latest Cook Political Report. Democrats will likely need to win six. The Democratic incumbents the union will work to re-elect are Bill Nelson in Florida, Joe Donnelly in Indiana, Claire McCaskill in Missouri, and Heidi Heitkamp in North Dakota. NEA is hampered by weak affiliates in these states. The Florida Education Association is the strongest of the four, but Republican Gov. Rick Scott is also the strongest opposing candidate. North Dakota in particular is an uphill climb. The union has 8,600 active members in the state, but President Trump won with 63 percent of the vote in 2016 and Libertarian presidential candidate Gary Johnson received more than 21,000 votes. It may be a close race, but it’s unlikely that North Dakota United, the merged NEA-AFT state affiliate, will be able to move the needle. The states where NEA hopes to pick up a seat held by the GOP include Arizona, Nevada, Tennessee, and Texas. 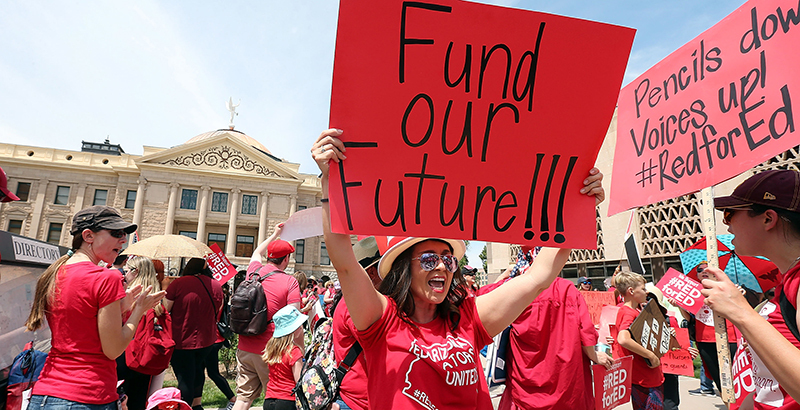 In Arizona, the union would like Rep. Kyrsten Sinema to ride momentum from last spring’s teacher walkouts to electoral victory. She faces Rep. Martha McSally. Nevada Sen. Dean Heller faces a challenge from Democrat Rep. Jacky Rosen. Nevada is the only state with an incumbent GOP senator running this year in a state that Hillary Clinton won in 2016. The retirement of Tennessee Sen. Bob Corker opened up his seat to possible Democratic pick-up. Rep. Marsha Blackburn faces former Gov. Phil Bredesen. Finally, the race with the most national exposure is Texas Sen. Ted Cruz defending his seat against Rep. Beto O’Rourke. NEA’s political action committee has already donated $3,000 to Donnelly, $10,000 to Heitkamp, $5,000 to McCaskill, $10,000 to Nelson, $7,000 to Rosen, and $10,000 to Sinema. AFT kicked in $10,000 each to Donnelly, Heitkamp, McCaskill, and Nelson. It gave $15,000 to Rosen and $5,000 to Sinema. The unions have long been a reliable source of campaign contributions to Democratic candidates, but their real value comes from independent expenditures and get-out-the-vote efforts. That spending comes out of dues money and is not limited to voluntary contributions to the union PAC by members. It will likely run into the tens of millions of dollars. The unions won’t be rescued by the Senate, or even the White House, should a Democrat recapture the presidency in 2020. Their best hope lies in winning governors’ mansions and state legislative majorities. Their ability to do so varies from state to state with membership levels and engagement. The November results should give us an indication either of resurgence or decline.